BIBLIOGRAPHY 78 Baluja, S. (1998), Probabilistic modeling for face orientation discrimination: Learning from la- beled and unlabeled examples. Advances in Neural Information Processing Systems. Bartlett, P., M. Collins, B. Taskar and D. McAllester (2004), Exponentiated gradient algorithms for large-margin structured classification, in Proceedings of Neural Information Proccessing Systems. Berger, A., S. D. Pietra and V. D. Pietra (1996), A maximum entropy approach to natural lan- guage processing. Computational linguistics, vol. 22(1), 39–72. Blum, A. and S. Chawla (2001), Learning labeled and unlabeled data using graph mincuts, in ICML-2001. Blum, A. and T. Mitchell (1998), Combining labeled and unlabeled data with co-training, in COLT-98. Bosco, C., V. Lombardo, D. Vassallo and L. Lesmo (2000), Building a treebank for italian: a data- driven annotation schema, in Proceedings of the 2nd International Conference on Language Resources and Evaluation LREC 2000, pp. 99–105, Athens. Boser, B. E., I. M. Guyon and V. N. Vapnik (1992), A training algorithm for optimal margin classifiers, in Proceedings of the 5th Annual Workshop on Computational Learning Theory (CoLT), pp. 144–152, Pittsburgh, U.S.A. Bruce, R. and J. Wiebe (1994), Word-sense disambiguation using decomposable models., in Pro- ceedings of the 32nd Annual Meeting of the Assosiation for Computational Linguistics (ACL), pp. 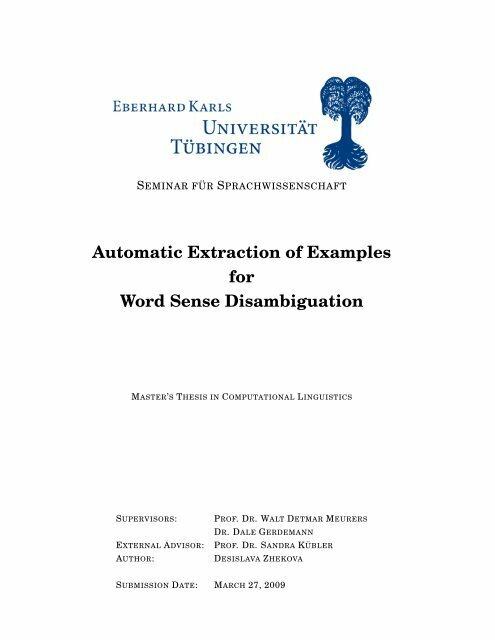 139–146, Las Cruces, U.S.A. Buitelaar, P., B. Magnini, C. Strapparava and P. Vossen (2007), Domain-Specific WSD, in E. Agirre and P. Edmonds, eds., Word Sense Disambiguation, pp. 275–298, Springer. Buscaldi, D., P. Rosso and F. Masulli (2004), The upv-unige-CIAOSENSO WSD System, in SENSEVAL-3: Third International Workshop on the Evaluation of Systems for the Semantic Analysis of Text, pp. 77–82, Association for Computational Linguistics, Barcelona, Spain. Cabezas, C., I. Bhattacharya and P. Resnik (2004), The University of Maryland SENSEVAL-3 System Description, in Proceedings of Senseval-3: Third International Workshop on the Eval- uation of Systems for the Semantic Analysis of Text, pp. 83–87, Association for Computational Linguistics, Barcelona, Spain. Calzolari, N. and O. Corazzari (2000), Senseval/Romanseval: The framework for Italian. Com- puters and the Humanities, vol. 34(1-2), 61–78. Calzolari, N., C. Soria, F. Bertagna and F. Barsotti (2002), Evaluating lexical resources using Senseval. Natural Language Engeneering, vol. 8(4), 375–390. CONTENTS 6 6.8.4 Discussion . . . .